London, UK, 05 January 2012 – Canon today unveiled the latest addition to its high-performance XEED projector range. The WUX5000 offers a high 5000 lumens brightness together with a range of Canon lens options and features to make installation as easy as possible. The WUX5000 provides exceptionally high image quality, making it ideally suited to a wide variety of corporate, education, leisure and retail environments. The WUX5000 is compatible with three different lenses: a standard zoom lens for most typical installations, a telephoto zoom lens for larger environments and a wide single focus lens, which can be used for rear projection applications. All lenses are also interchangeable with the WUX4000. Benefiting from Canon’s 70-year heritage at the forefront of lens design, the three lenses offer image sizes of between 40 inches and 600 inches, a maximum throw distance of 48.5 metres, and virtually no reduction in brightness, even when using the long zoom or wide single focus lens options. Offering 5000 lumens of true ‘colour brightness’, colours are displayed with virtually the same intensity as white, crucial for displaying the full impact of photographs and video content. As well as superior lens design, the WUX5000 also includes cutting edge technology within the projector to deliver outstanding optical quality. LCOS panels combined with WUXGA resolution provide seamless images without the ‘rainbow’ and ‘lattice’ effects that are often experienced with rival projection technologies. In addition, Canon’s unique AISYS (Aspectual Illumination System) – an advanced optical technology that maximises the performance of the LCOS panels – delivers high levels of brightness and contrast simultaneously, while Canon’s colour matching technology offers images that closely resemble that of a professionally calibrated sRGB monitor. The WUX5000 combines high performance with usability by offering motorised lens shift, which allows the installer to reposition the display using either the projector’s control panel or the remote control handset. Images can be adjusted to within 0.5 pixels both vertically and horizontally, essential in multi-projector installations where images overlap, for example, 3D, stacked or blended systems. It also means that one person can easily install the projector and then make final adjustments from the ground using the remote handset. 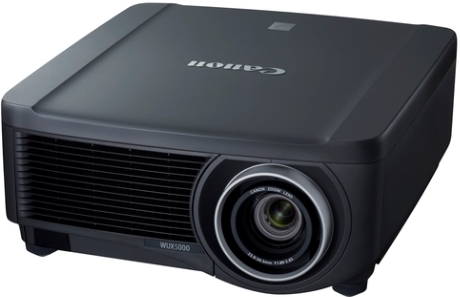 Providing maximum versatility, the WUX5000 offers 360 degree projection, so that images can be projected onto the floor or ceiling. This makes the device particularly suitable for bespoke installations such as museums, visitor centres or theatre auditoriums. The Canon XEED WUX5000 will be available across Europe from Q1 2012. A ‘Medical’ version (complete with DICOM Preset image mode) will be available later in the year.